The Toronto Sun newspaper commissioned this unique mural for the long side of their new building. 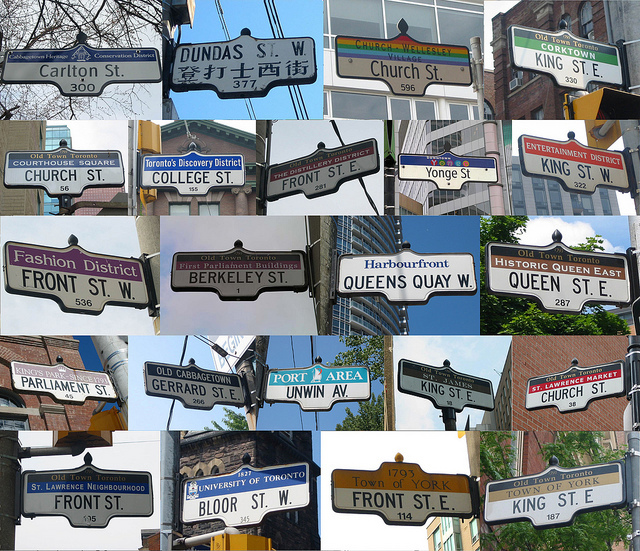 Created in 1993 by John and Alexandra Hood, it depicted 200 years of Toronto's history and dominated its stretch of Front Street. Last year, after selling this part of the structure, the mural was torn down. 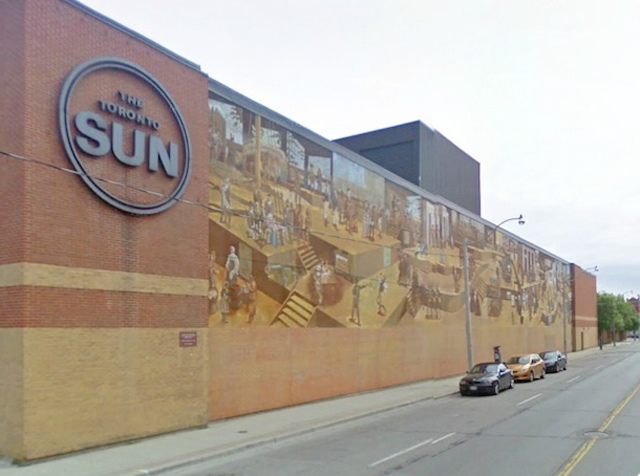 It has been replaced by a Dollarama, an LCBO outlet, a pet food store, and a bank branch. 25 March 1937 Hector Fraser Dougall married Clara Helen Freiberg at St. Paul's United Church, Port Arthur, Ontario. The United Church of Canada was not very old at that time; it amalgamated previous Methodist, a large proportion of Presbyterian, and Congregational denominations. The ecumenical choice for the ceremony is of interest to me because although the groom's family background was solidly Presbyterian, the bride's parents came from Lutheran and Russian Orthodox backgrounds. Hector and Clare were my parents and lived in Port Arthur, Ontario. 21 Mar 2007 Brenda's blog was born. Under the Zodiac sign of Aries (not my personal sign). Whatever can I deduce from that? The traditional 5th anniversary symbol is wood. That's representative of my head sometimes. Oh, BUT ... Now we have modern guidelines. The 5th seems to be silverware now. Not just any old silver … silverware. I guess that's for anyone who wants to send me some Wallace sterling Rosepoint salad forks. 26 March [Julian calendar] 1872 Marija Jurikas was born at Krūmiņi farm, Lāde parish, Limbaži region, Latvia. She was the third of seven children born to Janis Jurikas and Katrina Tukums. Like many Latvians, the family had converted to Russian Orthodoxy in the 1840s. Later in the nineteenth century came a “Russification” period in Latvia and so the Jurikas children were comparatively well-educated. Marija, my grandmother, was a seamstress who headed for the bright lights of St. Petersburg. 26 March 1913 Clara Helen Freiberg was born in Port Arthur, Ontario (now Thunder Bay), daughter and only child of Latvian immigrants Victor Freiberg and Maria Jurikas--sharing a birthday with her mother. Clare became a journalist with the local newspaper, and in later life became involved with various creative arts. ... because the editorial we reached five years old. Let's have cake .. pass the Caramel Crunch. That's right, chocolate addicts, none of your brown goo. I am of the tiny minority who regard chocolate as a repellent, mind-altering substance. For once, it's not about you. Not to my credit or anything; we all have addictions. Take whipped cream, for example. At this stage, many of my colleagues reflect on their growth and goals. I'd rather not because I still don't know if I'm writing for them or for a nebulous family posterity or just for obsessive moi. The blog is a hodge podge—something like my mind—of all three. Cruising the Suez Canal and riding camels apparently induces severe writer's block so I'm thankful we are over that hump for the time being. I'm also grateful for my readers who stick around. Despite often living in the eighteenth century, I do prefer looking forward than reviewing the recent past where one can only sing always look on the bright side of life. It's just as well my family history books are not being bought up by the carload because all you cousins are contacting me now. If I weren't answering 9,000 emails I could be organizing all that new information. Luckily the incoming contains plenty of fodder for my favourite pastime of analysis and problem-solving. By some minor miracle my board-certified status was renewed yet again; for the next five years it's a solid island in a turbulent shipwrecked world. Uh no; why that image? An oasis of sanity in my desert. pphhtttt ... you get it. Like all well-rounded family historians, I have a life outside genealogical circles and don't always eat at my computer admiring other people's blogs. I strictly regulate my time on Facebrick (learning new slang, but actually using it has been problematic) and Google+ (more mature discussions, we say) but it's always a case where time expands alarmingly. I've been known to speak in person to my offspring and made a visit to my hometown this past summer. I have a garden; a tiny urban garden where I valiantly battle for soil rights with a stupid unreasonable tree that some misguided landscaper plopped in years ago. My volunteerism lurches between a couple of secretary positions and regular deposits to the clothing bank. My political activism went into a coma in 1978 but revives periodically, mainly in defence of my performing artists home against berserk fire department officials and similar outrageous conspiracies for which the resident creative souls require patient exposition. Furthermore, to prove I have a life, every few weeks I panic to see if my scattered friends remember me so we can talk of books, movies, climate change, health-related crap, that fabulous Jane Fonda, and celebrity chefs. I spatchcock posts into my other blog for occasional relief from all this tension. If I weren't answering 9,000 emails some of this would make sense and I could spend more time writing. Thank goodness for owners and developers who retain and restore buildings of historical and aesthetic charm. From a new cousin via MyHeritage, I have learned the date of death for George Dougall and more about his daughter Jane. The best part was receiving photographs of George Dougall and his wife. In turn, I was able to provide information about George, his other children, and a family photograph. This is an update to my published Dougall family history, with the original narrative condensed and tailored to blog formatting. It made me aware of how much I now use online materials for information and clues. New information appears in this colour. George Dougall was born 24 May 1818 in West Calder, Edinburghshire, Scotland, the fourth son of John and Marion (Hastie) Dougall; he died 28 Sep 1904 in Montreal. On 2 March 1842 he married Agnes Moffat at St. Gabriel Street Presbyterian Church in Montreal. Agnes was born 23 April 1819; she died 22 September 1879 in Montreal. George, who became a tailor by occupation, had emigrated with his parents and siblings to Lower Canada in 1834. After some time in Laprairie they moved to Beech Ridge at St. Andrews East in Argenteuil County. Land records for the County of Argenteuil revealed it was George who first acquired the property known as his father’s farm, lot 20 south side Beech Ridge, St. Andrews, Argenteuil, from Thomas Cochran in 1839. From that time George was the seigneurial tenant of record. He may have actually lived in Montreal during that time, or at least by the time he married. Despite the gap between seigneurial records and the cadastral system between 1873 and 1884, we can see that George’s family was still involved with the Beech Ridge property almost fifty years after the purchase. On the death of his wife Agnes, who had a substantial interest in the property, her heirs (her surviving children) transferred their claims to their father. Then George Sr., the same day in 1884, sold the farm to John Francis Mitchell of Beech Ridge. By that time, the cadastral system was in place and the farm was designated lot 713, Saint Andrews, Argenteuil District. In 1871, George, a “cutter,” lived in St Antoine Ward of Montreal. The occupations of his children at that time are shown below in parentheses. I doubt Blogger is going to handle the original formatting for children, so I will have to make do. Individual numbers have been omitted. i. JANE3 DOUGALL, born 13 December 1842, was baptized 15 January 1843 at Erskine Presbyterian Church, Montreal. She became a teacher and married widower Sampson Paul Robins, son of Paul Robins and the late Ann Vickery, 4 July 1871 in Montreal. John Dougall was a witness. On the marriage record, Robins’ first wife was noted as the late Elizabeth Hare. He was born 27 January 1833 in County Kent, England, and died 9 February 1930 in Montreal. In 1881, Robins was a city schools superintendent. In 1884, he acted as attorney and agent for his wife and two of her brothers in settling her mother’s estate. Jane’s father George Dougall Sr. was living with them in 1891. Jane Dougall and Sampson Paul Robins had two children: George Dougall Robins, 4 June 1872–26 July 1972 and Sampson Paul Robins, 26 November 1874–8 February 1952. Births, baptisms, most marriages, and some burials for the next children of George Dougall and Agnes Moffat were found in the original records of Erskine Presbyterian Church, Montreal, by researcher Salli Dyson. Some events confirmed or newly uncovered were found via digital images in the Drouin Collection at Ancestry.ca or in other sources, as indicated. ii. JOHN DOUGALL, born 1 February 1845, baptized 16 February 1845 (millwright). He is likely the manufacturer who died 25 March 1883 in Hochelaga, Montreal. S.P. Robins and W. Drysdale were witnesses at the burial on the 27th. iii. JAMES JOSEPH DOUGALL, born 25 July 1847, he was baptized 12 September 1847 (carpenter). He died 17 May 1940 in West Kildonan, Winnipeg, Manitoba. He married on 28 February 1883 his first cousin Ellen Dougall, the sixth daughter of his uncle James Dougall and wife Agnes Fenton of Cowansville, Quebec. James McCrudden and Clara H. Dougall were witnesses. Ellen was born 8 February 1856 and died in Winnipeg later than 1940. Their daughter told me the couple is buried in Manitou Cemetery, Manitou, Manitoba. James J. was living at Pembina, Manitoba, when he married. He and Ellen cultivated a pioneer farm there. After many years of hard work, they rented their farm in 1919 and moved to 125 St. Anthony Avenue in Winnipeg. They had two unmarried daughters: Agnes Benning Dougall (1884-1967), a teacher who cared for her elderly parents, and Elizabeth Jane Dougall (ca.1885). iv. GEORGE MOFFAT DOUGALL, born 1 October 1849, baptized 18 November 1849 (clerk). He died 15 July 1881 in Woodstock, Ontario, at a young age. George Dougall “the younger” married Agnes Jane Kirkby, daughter of Robert Kirkby and Ann Harrison “of England,” on 5 April 1875 at 261 St. George Street, Montreal. George became an organ maker but after his death Agnes worked as a dressmaker. Their known children were Angus (ca.1877), Peter Moffat (1878), and Agnes (1881). v. THOMAS HASTIE DOUGALL, born 17 December 1851, baptized 11 January 1852; he died 2 December 1852 and was buried two days later on the 4th by the Erskine pastor. vi. ROBERT McBRIDE DOUGALL, born 28 September 1853, baptized 13 November 1853 (joiner); he died 28 May 1892 in Montreal. Robert married Annie McCrudden 22 March 1877. The 1901 census shows his widow Annie, a chef, with children William (ca.1879), George (ca,1879), Edna (ca.1886), and Robert (ca.1890). vii. PETER DOUGALL, born 5 December 1855, baptized 13 January 1856. He died 27 December 1939 at Pembina, Manitoba. He married Helen Anderson who predeceased him in 1935. Peter was a naval engineer in the Merchant Marine before migrating to Manitoba and taking up a farm near his older brother. Peter and Helen had one child, George Lorne Dougall (1883). I find sites like MyHeritage and Geni.com difficult to navigate and very frustrating source-wise. Maybe I should say non-source-wise. My experience so far indicates emphasis on name collecting. And the charts are cumbersome to work with. Charts are all very well as tools, but my preference is definitely narrative genealogies, or at least give me a printable lineage! Colour me old-fashioned. John Dougall family bible, as transcribed by his granddaughter Helen Locke (the original bible is long missing). Baptisms appear in West Calder registers for the first three sons but not George and the next children. Peter Smith website, MyHeritage (http://www.myheritage.com/site-379873/smith#newsfeedLocation)—where the date is 22 September. “Quebec Vital & Church Records 1621-1967 (Drouin Collection),” digital image, Ancestry.ca (www.ancestry.ca/ : accessed 12 March 2012); Erskine Presbyterian Church (Montreal, Quebec), 1904, folio 17, burial George Dougall. St. Gabriel Street Presbyterian Church (Montreal, Quebec), 1842, folio 12, Dougall-Moffat marriage. Unfortunately I learned no further information from the MyHeritage site about Agnes: e.g. parents, place of birth, etc. Seigneurie d’Argenteuil Records, Registres de Comptabilité, (1849-1860) no. 149, and (1863-1876) no. 463; Bibliothèque et Archives nationales de Québec (BAnQ), Montreal Branch, microfilm nos. 3383 & 3823. Cadastre System Records, Saint Andrews, Quebec, cadastral lot 713, document no. 9148, notary Hugh Brodie, 18 December 1884, Robert McBride Dougall et al to George Dougall; Argenteuil Land Registry Office. 1871 Census Quebec, District 106, Montreal, St Antoine Ward, subdistrict B, division 2, p. 83, George Dougall household; digital image, Ancestry.ca (http://www.ancestry.ca : accessed 9 October 2010). Microfilm uncited, but St Antoine Ward is on Library and Archives Canada (LAC) microfilm C-10046-10048. Erskine Presbyterian Church (Montreal, Quebec), 1842, folio 2, baptism Jane Dougall. “Quebec Vital & Church Records 1621-1967 (Drouin Collection),” digital images, Ancestry.ca (http://www.ancestry.ca/ : accessed 5 December 2009); Erskine Presbyterian Church (Montreal, Quebec),1871, folio 32, Robins-Dougall marriage. 1881 Census Quebec, District 91, Hochelaga, Subdistrict E1, Hochelaga Village, pp. 39-40, Samson Robins household; digital image, Ancestry.ca (http://www.ancestry.ca/ : accessed 5 December 2009), citing LAC microfilm C-13221. Three older girls (Lillian, Bertha, Edith) appear to be children by Robins’ first wife, judging by the enumerated birthplace of their mother. Cadastre System Records, Saint Andrews, Quebec, cadastral lot 713, document no. 9149, notary Hugh Brodie, 18 December 1884, George Dougall to John Francis Mitchell; Argenteuil Land Registry Office. 1891 Census Quebec, District 154, Hochelaga, Subdistrict G, Hochelaga, Division 1, p. 5, S. Robins household; digital image, Ancestry.ca (http://www.ancestry.ca : accessed 5 December 2009), citing LAC microfilm T-6396. “Quebec Vital and Church Records 1621-1967 (Drouin Collection),” digital images, Ancestry.ca (www.ancestry.ca : accessed 12 March 2012); citing Erskine Presbyterian Church (Montreal, Quebec), 1883, folio 5, burial John Dougall. James J. Dougall, Manitoba death registration no. 018207 (1940); Government of Manitoba Vital Statistics database (http://vitalstats.gov.mb.ca/Query.php : accessed 12 March 2012). “Quebec Vital & Church Records 1621-1967 (Drouin Collection),” digital images, Ancestry.ca (www.ancestry.ca : accessed 12 March 2012); East End Rue Lagauchetière Methodist Church (Montreal, Quebec), 1883, folio 5, Dougall-Dougall marriage. “Mrs. James J. Dougall,” undated, uncited newspaper clipping in loose notes of daughter Agnes B. Dougall. “Ontario, Canada, Birth, Marriage and Death Records,” digital images, Ancestry.ca (www.ancestry.ca : accessed 13 October 2009); George Dougall, Ontario death registration no. 014589 (1881), citing Archives of Ontario microfilm MS 935 reel 28. “Quebec Vital & Church Records 1621-1967 (Drouin Collection),” digital images, Ancestry.ca (www.ancestry.ca : accessed 6 December 2009); St-Jean French Presbyterian Church (Montreal, Quebec),1875, folio 2, Dougall-Kirkby marriage. 1881 Census Ontario, District 166, Oxford North, Subdistrict Woodstock Town, Division 2, pp. 34-35, George Dougal household; digital image, Ancestry.ca (www.ancestry.ca : accessed 6 December 2009), citing LAC microfilm C-13267. 1891 Census Ontario, District 104, Oxford North, Subdistrict f, Town of Woodstock, Division 2, p. 64, Agnes Dougall household; digital image, Ancestry.ca (www.ancestry.ca : accessed 6 December 2009), citing LAC microfilm T-6360. “Quebec Vital and Church Records 1621-1967 (Drouin Collection),” digital images, Ancestry.ca (http://www.ancestry.ca : accessed 9 October 2010); St Marks Presbyterian Church (Montreal, Quebec),1877, folio 4, Dougall-McCrudden marriage. 1901 Census Quebec, District 175, Montreal, Subdistrict a, St Antoine Ward, polling subdivision 74, p. 12, Annie Dougall household; digital image, Ancestry.ca (http://www.ancestry.ca : accessed 9 October 2010). Microfilm uncited, but the ward is on LAC films T-6533-4. Peter Dougall, death registration no. 39-06-048423 (1939); Government of Manitoba Vital Statistics database (http://vitalstats.gov.mb.ca/Query.php : accessed 6 December 2009). Agnes B. Dougall to Hector F. Dougall, loose notes 1930s-1950s. Happy 178th birthday on your official incorporation, Toronto ... 5 March 1834. 2 March 1852 Peter Dougall married Catharine Fraser at St. Andrews Presbyterian Church, St. Andrews East, Quebec. Peter was a native of Midlothian, having emigrated to Argenteuil Seigniory/County with his parents in 1834. Catharine was a Quebec native and a double Fraser—her father John Fraser from Perthshire, and her mother Ann (Nancy) Fraser of an Inverness-shire line. Peter and Catharine lived long and productive lives mainly in Renfrew, Ontario, raising nine children there. In their old age they moved to Winnipeg, Manitoba, to be near some of their children. 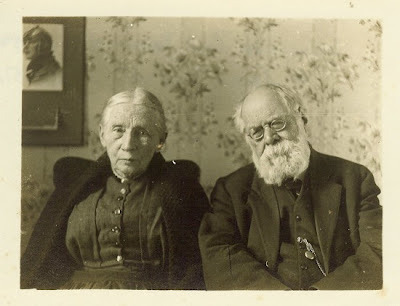 They were two of my great-grandparents. 3 March 1811 Ann (“Nancy”) Fraser was born at River Rouge, civil parish of St. Andrews East, Lower Canada, and baptized upriver at Chatham as the daughter of John and Margaret Fraser on 14 June 1812. Nancy’s parents drove seven miles from River Rouge to Chatham for baptism by Anglican minister Rev. Richard Bradford because St. Andrews had no resident Protestant clergyman yet. The Frasers were accompanied by John and Catherine Cameron who were taking their son for baptism. John Cameron and Peter Dewar, two River Rouge neighbours, were sponsors for Nancy’s baptism. I hope to make a case that Nancy's mother Margery (Margaret in some records) McIntyre and John Cameron's wife, Catherine McIntyre, were sisters. Nancy is part of my Inverness-shire Fraser line, and was one of my great-great-grandmothers. 14 March 1894 William Charles Dougall married Jessie Isabella (Belle) McFadyen at Sunnyside (now Springfield), Manitoba. The wedding took place at Belle's family farm home. A Winnipeg newspaper account listed every gift the couple received, from crystal and china to linens. The bride's “beautiful costume” was also noted, unfortunately without further description. Seventy guests sat down to dinner after the ceremony; “dancing and amusements were indulged during the evening.” They lived in Winnipeg most of their lives, raising a family of three. Will and Belle were my paternal grandparents.